4th Grade Math Test Prep for the Year Bundle - 43 Packets! Don't let test prep or skills review stress you out! 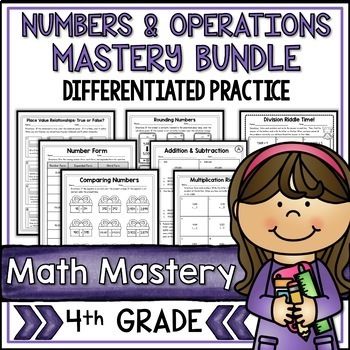 Numbers and Operations Thinking practice and mastery is easy with this Math Mastery Bundle! This set of 8 packets of printable worksheets is perfect for practicing key numbers and operations skills, independent practice, small group work, intervention, homework, and yes..... test prep! 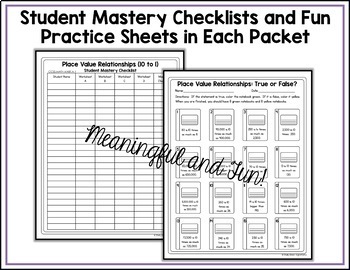 Each packet in this bundle now has a version with Common Core standards printed on each sheet AND a version without CC standards on each sheet! You choose the version that best meets your individual needs! By purchasing this bundle, you are saving 20% off the total price of the individual packets! Click here to save even more with the HUGE YEAR-LONG BUNDLE of ALL FOURTH GRADE Common Core Math Standard Packets. Each packet has 4 pages of skills practice. They are labeled with the letters A,B,C, and D on the top right corner. Sheets A and B are multiple choice, while sheets C and D are open-ended. Sheets C and D have exactly the same questions as A and B. This was intentionally done for the purpose of differentiation. Struggling learners might do best with pages A and B, while students needing a challenge might benefit from pages C and D. This way, students are getting the same content and questions, just presented in a different manner. Differentiation is tough for teachers! I hope this makes it easier! • Pages 5-10 of each packet do NOT have the Common Core standards listed on the pages. This is for those teachers who work in districts where they are not allowed to have CC standards listed on materials used in class. • Pages 11-16 of each packet DO have the CC standards listed on them, for teachers whose districts require it. You choose the pages that work best for your school situation.